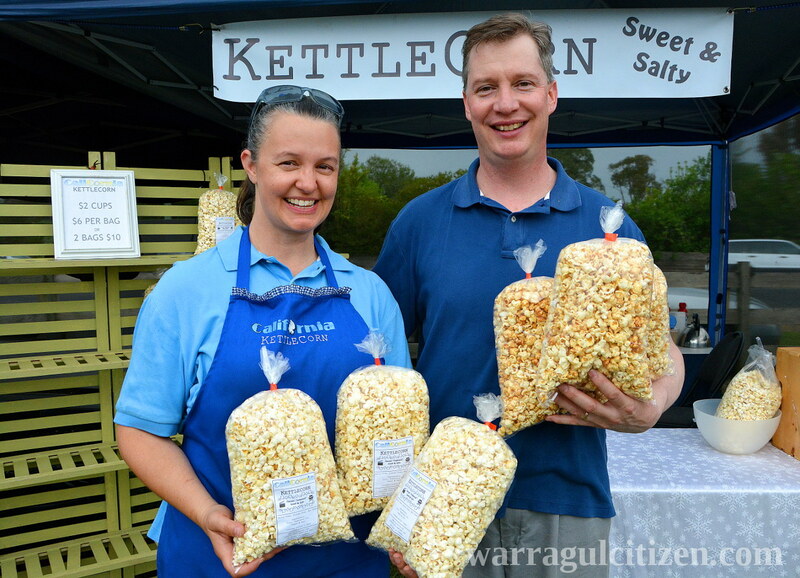 AT THE MARKETS // Those who frequent many of the markets around Baw Baw will recognise Californian couple Carl and Sandra Wenz’s kettle corn stall, but many do not know what it is they sell. WBBC found out. You’re based in Pakenham, you’re doing all the markets, how do people respond to the kettle corn? Sandra: It’s very popular. People enjoy the different flavours. We have sweet and salty, cinnamon, chocolate and spicy. And you’ve been experimenting with a barbecue flavour? Carl: We’ve experimented with a vanilla flavour, a strawberry flavour, an apple pie flavour and today we did a sweet and smoky barbecue flavour. How hard is it to create those flavours? Carl: Anything in a powder form is really easy to create. If it’s liquid you don’t get a good pop because it shrinks the pop size. Anything you can powder can be used? Carl: Yes, we’re thinking of maybe trying a cheese flavour next. What’s the process of making kettle corn? Carl: We have a giant kettle, it’s 160 quarts, and we start with oil and when it gets hot enough we put the corn kernels in. Then we get a pop of top layer and we add our ingredients while stirring. When it pops fully we put it in the cooling bin and add salt. California. Kettle corn is an item you can find at any shopping centre on the weekend in California, and it was something we missed when we came over here so we got the equipment and started making it out here. It is a very American thing to be setting up here. Do people recognise what you’re selling? Carl: we try to do as many samples as we can because they think it’s just normal popcorn. Once they sample it, most people fall in love with it. Sandra: it tends to be healthier than cinema popcorn or sometimes microwave popcorn. Get a buzz from these green goodies!